Product prices and availability are accurate as of 2019-03-21 08:08:37 EDT and are subject to change. Any price and availability information displayed on http://www.amazon.com/ at the time of purchase will apply to the purchase of this product. Hardy Zones 5-9 Silver Plumes Mature Height: 10' Full Sun Immediate shipping . Dormant shipping in winter. ORNAMENTAL GRASSES: Grasses provide structure and texture to your garden, offering many shapes, heights and colors. Most will "bloom' with attractive seed fronds that move with the breeze. 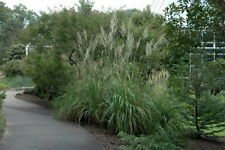 (Ravenna Grass) Erianthus ravennae is also known as 'Hardy Pampas Grass' due to the huge plumes that resemble its Southern cousins. By late summer, the plumes begin to shoot skyward and provide movement in the garden with just the slightest breeze. With foliage that reaches 5 feet tall and plumes that tower to 8-12 feet, Erianthus ravennae is an ideal grass to make a living windbreak or screen. Also provides excellent winter interest in the landscape.